That said, I rarely cook Indian food at home. I don’t know why! I guess I feel intimidated? 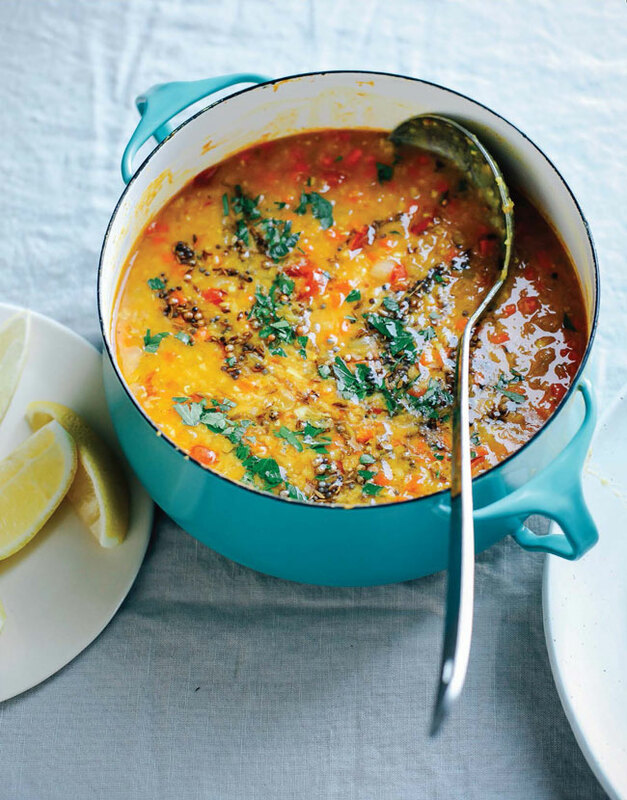 But this Weeknight Root Vegetable Dal, from The First Mess Cookbook, is the perfect recipe to start with. It’s made with spices you probably already have on hand in your kitchen, protein-rich red lentils, and your choice of diced root vegetables. Combine the dal ingredients with water in a big pot, let everything simmer for 40 minutes, and make the toasted spice oil to drizzle over the top—so easy. 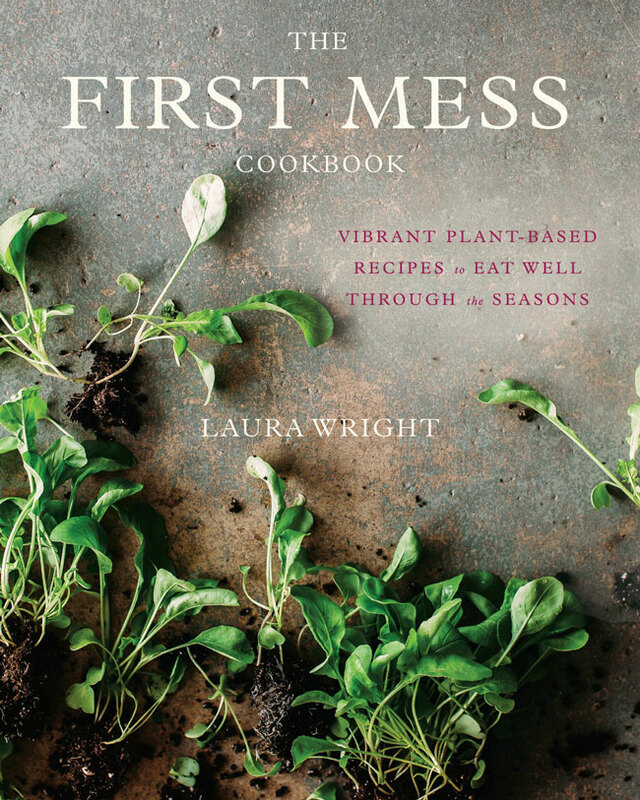 With over 125 seasonal plant-based, whole food recipes, Laura Wright’s The First Mess Cookbook is a must-have for any healthy cook. I’ve admired Laura’s blog for years—the photos are gorgeous and the recipes combine flavors in unexpected, ingenious ways that make you wonder, “why didn’t I think of that? !” I’m already counting down the weeks until I can pick up my first CSA box of the season because this book is packed with ideas for all that produce—Brussels Sprouts Salad with Lime and Miso, Spice-Crusted Cauliflower with Walnut Sauce, Roasted Carrots with Ginger Maple Cream…bring it on! To a medium soup pot, add the rinsed lentils, diced root vegetables, diced onion, tomatoes, garlic, ginger, turmeric, and chili flakes. Pour the water into the pot and give everything a little stir. Place the pot on the stove over medium heat. Bring to a boil and then simmer for about 40 minutes, whisking the dal often. Toward the end, the lentils should be completely broken down. In the last 10 minutes of cooking, whisk the dal vigorously to encourage the breaking down of the lentils. It should appear quite soupy. Season the dal generously with salt and pepper. Keep warm. Heat the coconut oil in a small sauté pan over medium-high heat. Add the cumin seeds, coriander seeds, and mustard seeds. Once the seeds are fragrant and popping, remove from the heat. Gently spoon the toasted spice oil (with the whole spices) on top of the dal. You can lightly stir it in if you like. You can also portion the dal out first and then spoon the spice oil on top if you like. Garnish the dal with the chopped cilantro. Serve the dal hot with lemon wedges.